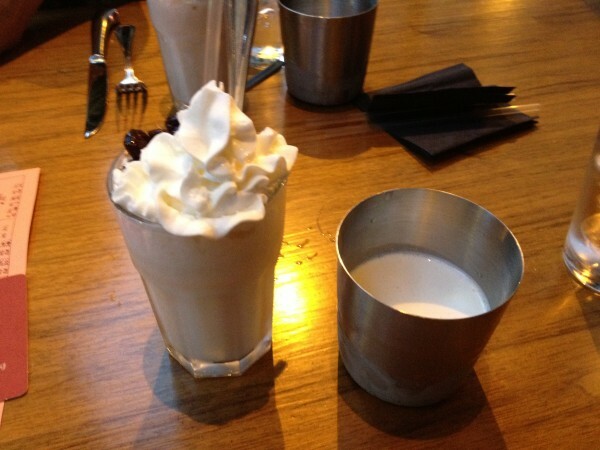 It sounded perfect: fried chicken and boozy milkshakes. It was exactly what I wanted after a hard day at the bridge table. 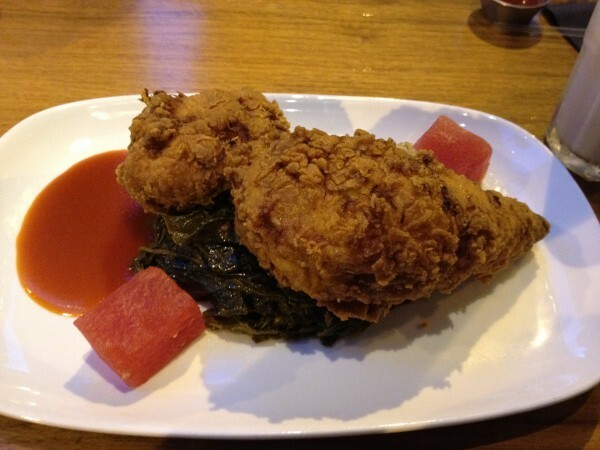 I enjoyed my chicken, but the collards were on the spicy side and I didn’t understand the kool-aid pickled watermelon. 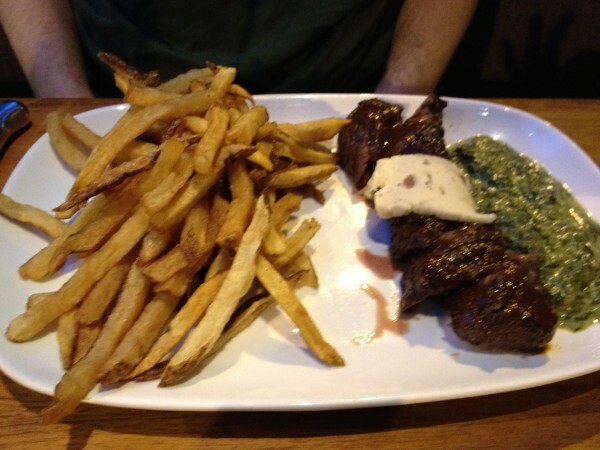 Steve thought his steak frites were only okay. My shake, cherries Jubliee, was sweet, creamy and strong. Our service was indifferent; in fact, we waited for my doggy bag of leftover chicken (cold fried chicken, yum!) but they forgot about us and we just gave up. Mike and I enjoyed breakfast at Sam’s, a “finer diner” a mile away from the bridge site. 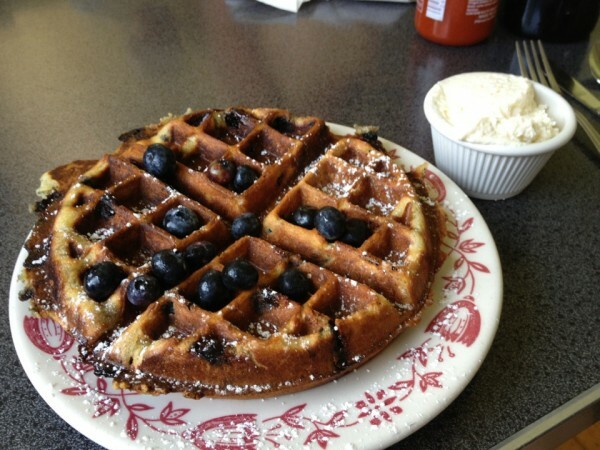 I ordered the lemon blueberry waffles and I was very pleased that the waffle had the correct texture – crispy on the outside, tender inside and lovely bright lemon flavor. Mike had a breakfast pizza, which was more like a huge opened face egg, potato sandwich. Mike ate his breakfast and still had enough of a meal later. He say it was excellent. I’m sad I didn’t get to try one of the biscuits – they looked excellent. 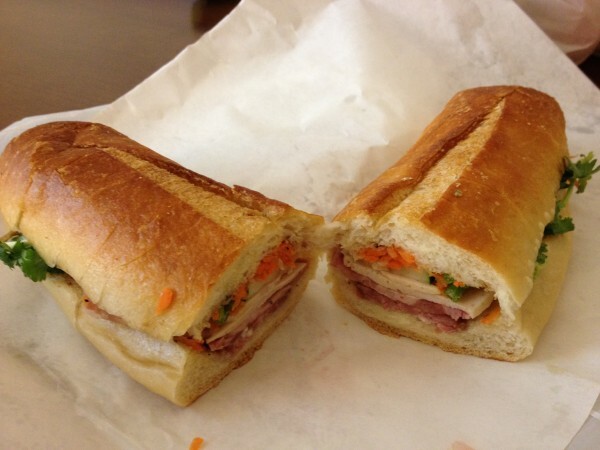 I’m always on the hunt for a good Banh Mi. Q.T. had some excellent reviews, and it was close to the site, so I dragged Marc there to try it. I got the combo, which includes all the cold cuts and pate. The sandwich was fine, except from one glaring flaw – the bread. Banh Mi is supposed to be made on a baguette made with rice flour, giving it the distinct, light, shatteringly crisp crust. This was on a *sourdough* baguette. Shudder. So wrong. Sorry, Philly, if you only had a Hong Cuc. 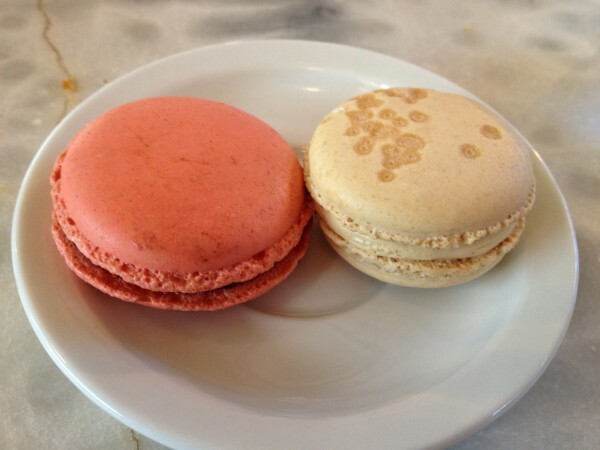 I love macarons and made Miel Patisserie a destination. I’m glad I did. I enjoyed two kinds: the salted caramel and raspberry. The cookies were light and had the perfect texture and the fillings were excellent. Ten days in Philly and how many cheesesteaks did I try? One. That’s right, just one. 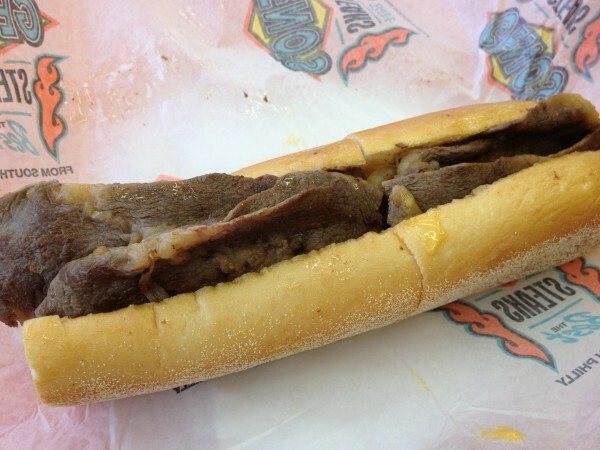 Watch as I offend a whole city with this sentence: there’s really nothing special about a Philly cheesesteak., especially when I “have to” get it with cheese whiz. Ewww. I knew I couldn’t leave the city with out having it at all, so after an early morning visit to the Italian Market (similar to Haymarket, for you Bostonians), I shared a cheesesteak with my friend Bob for breakfast. Bob had tried Pat’s cheesesteak earlier in the week and he wasn’t impressed, so it wasn’t difficult to convince him to try Geno’s, and there is no line at 8am. 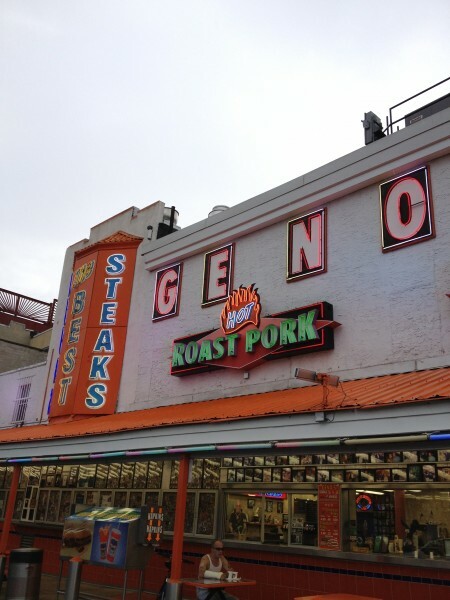 We got one “wit onions and wiz.” Bob liked Geno’s more than Pat’s – he declared that the meat was more tender and flavorful. I thought the meat was fine, but the bread was awful. In fact, I was beginning to see a theme, as my sandwiches from Beck’s, QT and Geno’s all had the same problem – inferior bread. I probably should have tried another cheesesteak place for comparison, but I’m just as happy with a steak and cheese sub from my local mom & pop shop. 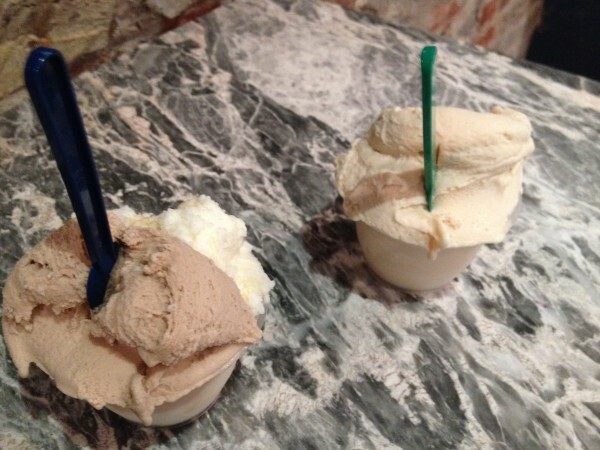 Capogiro Gelato is an artistian gelato shop with several locations in the city. I went twice, and enjoyed the dulce du leche, pistachio, hazelnut and cappuccino flavors. The consistency is smooth and creamy, as you would expect and great robust flavors. I wish Boston had a comparable gelato shop. I always try to find a microbrewery for Steve to enjoy. I got mussels and they were fine. He got pizza and tried two different beers. I can’t really tell you too much more, as I don’t drink beer, but he seemed to enjoy them.